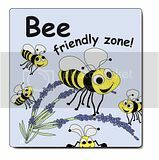 The Natural Bee Keepers are encouraging green gardeners and landowners to publicise their postcodes on their websites and also to download their logo to put in their gardens, allotments etc to raise awareness of pesticide and harmful chemical free zones. That's a great idea and overall I wish people would leave their gardens a bit wilder. Not only do I personally prefer the look, it's beneficial to wildlife. Unfortunately our rental house only has grass in the garden. 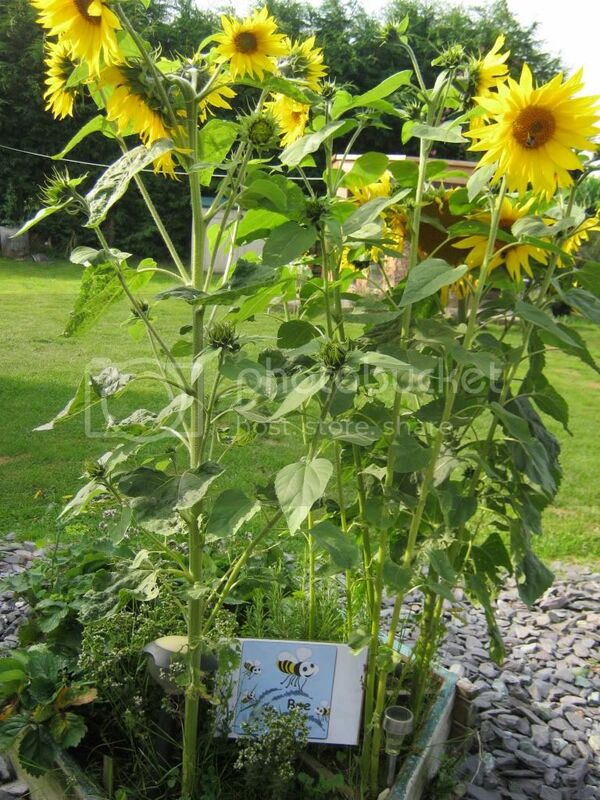 I've got a few sunflowers and a fair amount of flowers and herbs in pots. Not worth planting anything. We have hives on our plots and we've several bee friendly areas. As well as flowers bees go for veg flowers, such as runner beans, tomatoes, squashes and if you let a few leeks run to seed with big flower heads they go mad for them! We have a large Buddleia in the garden at the corner of the chooks run, butterfly's love it, as does the resident Bees in next doors chimney stack! ..
Our wild bees are under pressure as we continue to change the natural landscape. I created a bit of a wild flower meadow this year by simply digging over an overgrown bit of land at the top of the garden. Once I had cleared things like brambles and the larger weeds, I just scattered wild flower seeds in the spring. I was surprised to see how well the seeds grew, giving a riot of colour and a heavenly haven for bees and other insects. we have a lavender bush must be five feet across in full flower, you should see the bees on it, getting more honey bees this year too, a bonus, we grow flowers rather than veg, for the birds bees and butterflies, seems more important somehow, and without bees we are truly stuffed! Bee,s are very much underated as without them all sorts of problems could arise. I grow a bit of borage that i was informed the bee,s like. I have a bed of about 15 Munstead (english) lavender plants on my allotment plot - they flower earlier than other varieties and you trim them back every year like a hedge after they have flowered so they don't grow too tall. But the biggest bee magnets have to be the sage, oregano and the comfrey flowers. In my garden, attracting bees especially in spring is paramount - my fruit trees rely on them. So I also have lots of spring flowering bulbs and plants to attract them to the garden before the fruit blossom open. I don't use pesticide if I can help it, and if there was a case where a bush/tree is at risk of dying I'll try something like washing up liquid (for aphid/white fly infestation) but if the problem is much more serious and I had no option then the best time to apply is AFTER the flowering period so that bees in particular are not affected. The other reason to avoid using pesticides is to encourage predators to the garden - as well as ladybirds, there are lots of other insects as well as frogs and birds. The bottom of my garden has unfortunately got very overgrown due more to neglect than on purpose. The other day I stopped looking at it as a gigantic garden task to tackle but saw it as a little wildlife sanctuary LOL - there seemed to be loads of birds, some of which I've never seen in my garden before. I have a feeling my neighbours don't quite think the same. Ah but the hedgehogs will love your overgrown bit - I've left my hedge to grow wild and now see loads of hedgehogs as well as frogs so am happy to leave it plus it cuts down the work - always a bonus - amd my sister just posted on facebook this year Dandelions aren't weeds they are bee food!